A Get is a Jewish divorce. Jewish divorce requires the consent of both the husband and wife; there is no requirement that either party establishes grounds for divorce such as unreasonable behaviour, separation or adultery. All that has to be shown is that both the husband and the wife agree to the Get taking place. The basic laws of the Jewish religious divorce can be found in the Bible (Devarim/Deuteronomy 24: 1-5). On receipt of an application for a Get, our Beth Din invites both husband and wife to attend interviews at the Beth Din. The average duration of each interview is approximately fifteen minutes. During the course of this interview, the Dayan will seek to check the relevant data relating to the writing of the Get. Applicants will be asked for details of their father's English and Hebrew names. The Dayan will also seek to ascertain if there are any issues which may cause delays at a later stage in the process. At a second session, the husband will attend the Beth Din and instruct the Scribe to write the Get. The Beth Din will present the husband with writing materials, which the husband will then give over to the Scribe so that he can write the Get on the husband's own materials. Before instructing the Scribe, the husband will be asked to give proof of his identity. He will also be asked to confirm that he is giving the Get of his own free will. Once the instruction of the Scribe has taken place (this takes about twenty five minutes) the Scribe, together with two witnesses (Eidim) and the husband's representative (shaliach), where appropriate, adjourn to a writing room. The Scribe then writes the Get. During this time, the husband and wife may leave the premises but must stay in London. The Get is usually completed, signed and witnessed within a period of around two hours. Once the document is complete and the Get has been checked by a Dayan, it is ready to be presented to the wife. In the event that the parties prefer not to meet, separate appointments can be arranged, in which case the Get is handed to the husband’s representative and then handed over to the wife on a separate occasion. When the Get is handed over, the wife will be asked if she is willing to receive the Get. If she is, her husband or (in the event that the husband is not present) his Shaliach, will recite a form of words at the request of the Dayanim, which indicates that on receipt of this Get, his wife will be free from the marriage. The Get is then placed into the wife's hands. 1. The wife clasps the Get between her hands (there should be no rings on her fingers) and lifts the Get above her head as a sign that she has acquired it for herself. 2. The wife then tucks the Get into her pocket or under one arm, turns away from her husband or his representative and walks several steps away from him as a sign that she has asserted her independence from him. 3. She then hands the Get back to the Dayan, so that it can be checked again by the Eidim (witnesses). Once received, the Get is the wife’s property. However, it is standard practice to deposit the Get with the Beth Din. The wife is then presented with a certificate, in Hebrew and English, stating that the Get has been duly executed and that the parties are free to remarry under Jewish law. The husband receives a similar certificate as well. Any party who feels that he or she is in need of moral support is welcome to bring a friend or family member with them to ease the strain and to provide some company. The Beth Din enjoys the services of a voluntary group of female Get helpers, who work to welcome wives to the Beth Din when they come to collect a Get and to provide valuable moral support when it is needed. These ladies are experienced in the Get procedure and are helpful and sympathetic. The Get procedure is a religious ceremony and ladies will be expected to dress modestly and cover their heads. A selection of scarves is available. Once the Get has been received by the wife, she is reminded by the Dayan that there are two restrictions upon remarriage. The first is that a Cohen may not marry a divorcee. The second is that a period of ninety two days should elapse before she can remarry. In due course, whilst the Get itself is retained at the Beth Din, a Get certificate is normally issued to both the husband and the wife as evidence that they are properly divorced in accordance with Jewish law. Where a remarriage is being contemplated by either party, they will need to obtain authorisation for this. This involves presenting the Get certificate. The Get certificate should therefore be retained in a safe place. Any person who has been married under Jewish law, according to the laws of Moses and Israel, requires a Get. Since Jewish law regards the mere fact of setting up home and living together as being possible evidence of marriage, the question should be asked of the Beth Din whether a Get is required in the event of cohabitation, registry office marriages and marriages between Jews which take place under non-orthodox Jewish auspices. If a party to a marriage is not Jewish, a Get is not necessary. How do I Apply For A Get? To make an application please go to www.theus.org.uk/applyforaget and complete the relevant details. Alternatively, if you prefer you can write to the Beth Din requesting a Get, giving your name, address and day time telephone numbers together with those of your spouse. You should enclose a photocopy of your Ketuba, (Jewish Marriage Certificate), a copy of your Divorce Decree Nisi and Absolute (if these have already been obtained) and a deposit cheque payable to USKB in the sum of £100. One of our Clerks will then contact you to take further details by telephone. The Beth Din will acknowledge your application and will write to you and your spouse individually inviting you to a preliminary appointment. If you wish to be seen separately, please mention this in your response. Do I Have To Meet My Spouse At Any Time During The Get Process? No. If the parties to a marriage are unwilling to attend the Beth Din at the same time, the Beth Din will offer the facility of separate preliminary interviews. We will also give the wife the option to receive the Get from her husband’s representative (Shaliach). Can I Apply For A Get Before Completion Of The Civil Divorce? You can apply for a Get at any time after the breakdown of the marriage. Although a Get cannot be written whilst the parties to a marriage are still living under the same roof, a Get file can be opened and the preliminary appointments can be held even whilst the parties are still living together. Under the Divorce (Religious Marriages) Act 2002, a person whose spouse is refusing to give/accept a Get can apply to the Court handling the civil divorce, for an Order preventing the Court making a Decree Absolute until such time as a Get has been given/accepted. It is therefore advisable to apply for a Get well before the making of a Decree Nisi in the civil proceedings. Please also see the FAQ below entitled Do I Need a Lawyer? What Happens If I Remarry Without A Get? An Orthodox Synagogue will not permit any remarriage without a Get. A wife who has a relationship with another man without first obtaining a Get is regarded by Jewish law as being adulterous. Any children from such a relationship (if the relationship is with a Jewish man) will have the tragic status of mamzer, (illegitimate in Jewish law) and will therefore not be permitted to marry in an Orthodox synagogue. Who Should Pay For The Get? The couple concerned should arrange between themselves or their solicitors, in the course of any negotiations, as to which of them will pay for the Get and this should be clearly stated in any consent order relating to financial provision. When a couple agree to share the cost of the Get, this agreement is only enforceable under English Law by the parties themselves and not by the Beth Din. Accordingly, the Beth Din reserves the right not to issue a Get certificate to either party until payment is received in full. How Much Does A Get Cost? The standard cost of a Get for 2016 is £695.00. For United Synagogue members there is a special reduced rate of £495.00. If the Get is being written overseas and handed over to a wife in this Beth Din, the fee is £100.00. Cheques are payable to USKB and card payments can be taken at the Beth Din on the day of your appointment. If you would like to pay in advance by BACS transfer into our account (Sort Code 60-80-07, Account number 54160537), please cite Get and your name as the reference. Why Does A Get Cost So Much? The Beth Din buys in the ancillary services of a “Sofer” (Scribe), “Eidim” (Witnesses) and a “Shaliach” (Agent). The result of this is that even before any account is taken of the time of the Dayanim and the Registrar, or of costs of administering Gittin, the cost to the Beth Din of each granted Get is in excess of the sum actually requested. What Happens If I Do Not Pay For My Get? No couple is ever turned away from this Beth Din on the basis that they cannot afford to pay for the Get which they require. However, the Beth Din will not issue the certificate that the Get has been granted (which is necessary if either party wishes to remarry) until payment has been made. What Happens If My Spouse Is Resident Abroad? If the overseas resident has access to an Orthodox Beth Din capable of administering the Get process, a Get can either be written in London and handed over to a wife overseas or written overseas and handed over in London. I Married In A Religious Ceremony Overseas. Do I Need A Civil Divorce As Well As A Get? If your overseas marriage is recognised by the English Authorities (which will usually be the case if it was registered by the civil authorities in the country in which it took place) then you will require a civil divorce in addition to a Get. My Spouse Lives In Israel And I Live In London. Would I Need A Civil Divorce? If the Get is both written and received in Israel and at least one of the parties to the marriage has a continuing legal connection with Israel, then no further civil divorce will be needed. However, if the Get is written in Israel and handed over in England or vice versa, a civil divorce will be required. It is unnecessary to instruct a lawyer with regard to a Get if there are no outstanding problems relating to children, maintenance or the matrimonial home. The Beth Din staff are experienced in dealing with members of the public and do their best to make sure that everybody who comes to the Beth Din is kept fully informed of the Get procedure in general and of the progress of their own case. If, however, your spouse is not co-operating with obtaining the Get, it would be in your interests to instruct a lawyer to advise you about the Divorce (Religious Marriages) Act 2002. There is an equivalent law in Scotland. Where a lawyer is instructed in relation to the civil proceedings, David Frei or Joanne Greenaway would be happy to liaise with them. 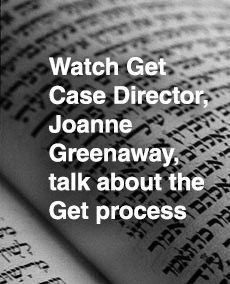 It can often be beneficial, as part of the Get process, for the Beth Din team to be fully aware of the stage reached in the civil proceedings and vice versa. Please also see the FAQ above entitled Can I Apply For A Get Before Completion Of The Civil Divorce? Do I Need The Consent Of My Spouse For A Get? Unlike the Courts of most countries, which decree that the marriage has been terminated (hence the terms “Decree Nisi” and “Decree Absolute”), the Beth Din simply supervises the writing of the Get on behalf of the husband and its transmission to the wife, to make sure that the many detailed halachic requirements relating to the Get are complied with. If either party is unwilling to co-operate in the Get, the Beth Din cannot override the consent of the parties for the Get but the Dayanim and other members of the London Beth Din staff will do their best to bring about the full and free consent of each party in order to enable a Get to be written. The London Beth Din seeks to ensure that the Get process is not abused and that the Get is not used as leverage in the context of ancillary issues in the divorce. It views such abuse as a chillul Hashem (a desecration of G-d’s name) and will use all sanctions at its disposal in such cases to bring about the giving and receiving of the Get. These may, in appropriate cases, include communal sanctions such as alerting the community to the Get refusal and advising them to refrain from business or social interactions with the Get refuser. In the case of members of the United Synagogue this could also include the withdrawal of privileges of US membership, including burial rights. In such cases the Beth Din will first issue a series of formal summonses (‘hazmanot’), following which an individual refusing to give a Get may be declared a ‘mesarev’ Get.